This study of methane (CH4) and carbon dioxide (CO2) emission modes from 40 lakes along a latitudinal transect in Alaska revealed that thermokarst lakes formed in Pleistocene-aged icy, organic-rich yedoma-type permafrost had the highest emissions. Ebullition and diffusion were the dominant modes of CH4 and CO2 emissions, respectively. Accounting for the global warming potentials of the gases, the climate warming impact of lake CH4 emissions was 2 times higher than that of CO2. Soil carbon dynamics of the past 2 decades in Swedish agricultural soils were assessed using three consecutive soil inventories. We found a significant increase in country-wide soil carbon concentrations, which is in contrast to trends reported in neighbouring countries. We explained this by a significant rise of the proportion of leys in Swedish agriculture, which was found to be strongly related to the increase in horse population. Human lifestyle can affect soil carbon. This study provides seasonal and interannual variation of simulated biogenic NO emission fluxes in a Sahelian rangeland in Mali, a region where intense NO emissions occur during the wet season. Emissions are related to their biogeochemical origin, to the quantity of biomass, and to the quantity of livestock, which drive the N pool and N turnover in the soil, using a coupled vegetation–litter decomposition–emission model. 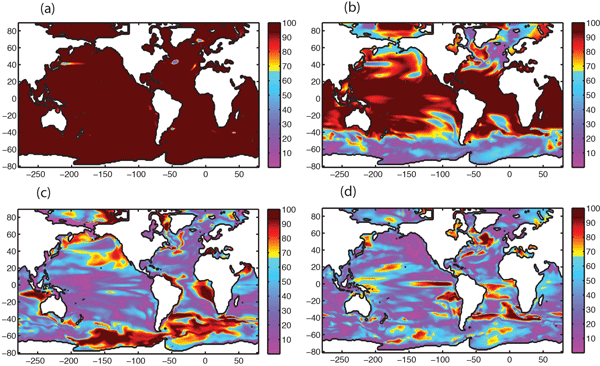 A large initial-condition ensemble suite of simulations with an Earth system model is applied to evaluate emergence characteristics of four ocean ecosystem drivers under climate change. The drivers considered are warming, acidification, deoxygenation, and perturbations to biological productivity. The spatial and temporal hierarchies of the emergence of these drivers are considered, using concepts of both time of emergence (ToE) and confidence intervals. We evaluated 21 forward models and 5 inversions over western Siberia in terms of CH4 emissions and simulated wetland areas and compared these results to an intensive in situ CH4 flux data set, several wetland maps, and two satellite inundation products. In addition to assembling a definitive collection of methane emissions estimates for the region, we were able to identify the types of wetland maps and model features necessary for accurate simulations of high-latitude wetlands. Y.-W. Liu, S. M. Aciego, and A. D. Wanamaker Jr.
We report the first high-resolution strontium (87Sr/86Sr and δ88/86Sr) and boron (δ11B) isotopic values in the aragonite shell of cultured Arctica islandica. These results suggest that well-preserved subfossil specimens may be used to determine the past Sr isotopic composition of seawater. The δ11B in this experiment suggests that the boron uptake of the shell changes at a temperature threshold of 13°C and a species-specific fractionation factor may be required for seawater pH reconstructions. In this paper, we used combines two existing methods (i.e. self-organizing maps and multiple linear regression) to estimate the ocean surface partial pressure of CO2 in the Baltic Sea from the remotely sensed sea surface temperature, chlorophyll, coloured dissolved organic matter, net primary production, and mixed-layer depth. The outputs of this research have a horizontal resolution of 4km and cover the 1998–2011 period. These outputs give a monthly map of the Baltic Sea. Microbial communities in injected water are expected to have a significant influence on those of reservoir strata in long-term water-flooding petroleum reservoirs. We thereby investigated the similarities and differences in microbial communities in water samples collected from the wellhead and downhole of injection wells, and from production wells in a homogeneous reservoir and a heterogeneous reservoir using high-throughput sequencing. The analysis of soil phosphorus (P) in fractions of different plant availability is a common approach to characterize the P status of forest soils. However, quantification of organic and inorganic P fractions is very labour intensive and therefore rarely applied for large sample numbers. Prediction of P fractions with NIRS can be a promising approach to replace conventional analysis, if models are developed for sets of soil samples with similar physical and chemical properties. We advance the Geometric Optical Radiative Transfer model and derive analytical solutions to radiation absorption by sunlit/shaded leaves. We link the radiative transfer process with the biochemical diffusion process to model canopy photosynthesis. Modeled gross primary production could explain more than 80% variance of flux tower measurements at both hourly and daily scales. We have modelled the carbon release from thawing permafrost soils under various scenarios of future warming. Our results suggests that up to about 140Pg of carbon could be released under strong warming by end of the century. We have shown that abrupt thaw processes under thermokarst lakes can unlock large amounts of perennially frozen carbon stored in deep deposits (which extend many metres into the soil). Technical Note: Silica stable isotopes and silicification in a carnivorous sponge Asbestopluma sp. The stable isotope composition of benthic sponge silica skeletons (spicules) has been shown to be a source of useful palaeoceanographic information about past deep seawater chemistry. Here, we investigate the biological vital effects on silica stable isotope composition in a Southern Ocean carnivorous sponge, Asbestopluma sp. We find significant variations in isotopic composition within the specimen – in both silicon and oxygen isotopes – that appear to be related to unusual spicule growth. We demonstrate that N addition reduced species richness, acidified soil and disturbed nutrient homeostasis in soil in an Inner Mongolia steppe. We further reveal that an increase in inorganic-N concentration, depletion of base cations (Ca2+ and Mg2+) and mobilization of Mn2+ and Cu2+ in soils were involved in reduction in species richness in the temperate steppe of northern China, highlighting the involvement of nutrient mobilization in decline in species richness of alkaline grasslands. One CARIOCA buoy deployed during the KEOPS2 expedition in Oct-Nov 2011 drifted eastward in the Kerguelen plume. Surface measurements of pCO2 and O2 were collected. Close to the polar front, the surface waters are a sink for CO2 and a source for O2, with mean fluxes equal to -8mmol CO2 m-2d-1 and +38mmol O2 m-2d-1. Outside an iron-enriched filament, the fluxes are in the opposite direction. NCP values of 60-140 mmol C m-2d-1 and stoichiometric ratios, O2/C, between 1.1 and 1.4 are computed. Photosynthetic production in the central Arctic Ocean is controlled by light availability below the ice, nitrate and silicate concentrations in the upper ocean, and the role of sub-ice algae that contributed up to 60% to primary production in summer 2012 during the record sea-ice minimum. 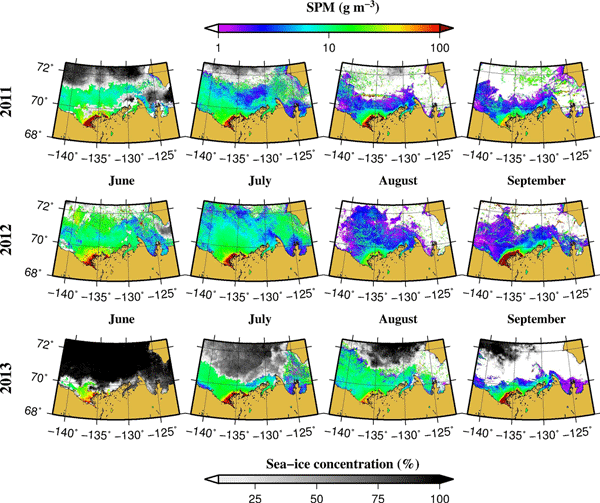 As sea ice decreases, an overall change in Arctic PP would be foremost related to a change in the role of the ice algal production and nutrient availability. A compilation of photosynthesis-irradiance measurements from the Ross Sea, Antarctica, was analyzed for spatial and temporal trends, as well as the oceanographic factors that control the responses. The maximum, chlorophyll-specific, irradiance-saturated rate averaged 1.07+/-0.060 ug C per ug Chl per hour. Spring rates were 59% greater than summer rates. Irradiance, CO2, and iron had significant effects on rates. The effects of time need to be incorporated into models of Antarctic production. We developed a statistical model of daily carbon consumption by fire for Alaska at 450m resolution between 2001 and 2012. We used field measurements from black spruce forests in Alaska to build nonlinear multiplicative models predicting carbon consumption by fire in response to environmental variables. Our analysis highlights the importance of accounting for the spatial heterogeneity within fuels and consumption when extrapolating emissions in space and time. This study focuses on the distribution of three heterotrophic prokaryote groups in relation to the environmental conditions met in the western part of NPSG. Our results showed that the high variability between the various heterotrophic prokaryote cluster abundances depend both on the mesoscale structures and the oligotrophic gradient. To the best of our knowledge, this study is the first report of the heterotrophic prokaryotes distribution under La Niña conditions in the western part of NPSG. A Europe-wide dynamic ammonia emissions model has been applied for one of the largest agricultural countries in Europe, and its sensitivity on the distribution of emissions among different agricultural functions was analysed. The results suggest that the dynamic emission model is most sensitive to emission from animal manure, in particular how this is connected to national regulations. In contrast, the model is most robust with respect to emission from buildings and storage. Our main objective was to assess which bottom-up processes can best predict changes in phytoplankton surface spring blooms in the North Atlantic. We applied new phenology algorithms to satellite-derived data and compared four different metrics based on physical drivers of phytoplankton. We show that there is a dominant physical mechanism - mixed layer shoaling - and that different regions are governed by different physical phenomena.